Table 39 in the original print and electronic versions of this report contained calculation errors in the column for the percentage distribution of awards to disabled workers aged 62 or older. The electronic version of this report has been corrected to reflect the correct percentages. Table 19-A—programming error resulted in incorrect rounding of the percentage distribution, by age, for "All disabled workers," "Men," and "Women" for 2005. The data were rounded to whole digits instead of to one decimal place. Disability benefits were paid to approximately 7.5 million people. Awards to disabled workers (821,207) accounted for about 90 percent of awards to all disabled beneficiaries (909,681). Payments to disabled beneficiaries totaled almost $76 billion. Benefits were terminated for 499,662 disabled workers. Supplemental Security Income payments were another source of income for about 1 out of 6 disabled beneficiaries. Workers accounted for the largest share of disabled beneficiaries (87 percent). Average age was nearly 52. Men represented about 54 percent. Mental disorders was the diagnosis for about a third. Average monthly benefit received was $938. Supplemental Security Income payments were another source of income for about 1 out of 7.
disabled beneficiaries receiving Social Security, Supplemental Security Income, or both. Kia Masseaux compiled this report for publication, and Carolyn A. Harrison managed the project. Carolyn A. Harrison, Art Kahn, Kevin Kulzer, and Clark Pickett wrote the programs to process the data and produce the statistical tables. Linda Martin wrote data specifications. Glenda Carter, Kevin Kulzer, Connie Marion, and Linda Martin validated the data. Staff of the Division of Information Resources edited the report and prepared the print and electronic versions for publication. The Old-Age and Survivors Insurance (OASI) program provides benefits to retired workers and their dependent family members and to survivors of deceased workers. The Disability Insurance (DI) program provides benefits to disabled workers, their spouses, and children (whether or not disabled). Benefits are paid from the OASI and DI trust funds. However, not all disabled beneficiaries are paid from the DI trust fund. All disabled widow(er)s' and most disabled adult children's benefits are paid from the OASI trust fund. Persons receiving disability benefits from either trust fund are referred to in this report as Social Security beneficiaries. Numbers presented in these tables may differ slightly from other published statistics because all tables are based on 100 percent data files. In addition, beginning in 2001, the definition of an award was changed to include secondary benefit awards, subsequent periods of disability, and conversions from one class of child's benefit to another and to exclude reinstated benefits. Those changes resulted in a slight increase in the award counts. 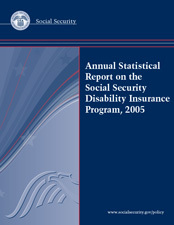 The tables on noninstitutionalized beneficiaries based on the Survey of Income and Program Participation (SIPP) have been removed from the Annual Statistical Report on the Social Security Disability Insurance Program, 2005. Because of increased attrition of survey participants over time and increasingly low match rates to administrative data, attempts were made to improve the reliability of estimates based on the SIPP. The Office of Research, Evaluation, and Statistics (ORES) contracted with the Census Bureau to conduct a special SIPP-based interview of Disability Insurance and Supplemental Security Income beneficiaries. Estimates based on the additional data were not available when this report was published. However, ORES anticipates publishing these estimates in another publication as well as highlighting the changes in the data and the reliability of the estimates. This decision reinforces the inherent differences between the survey data used to produce the estimates of noninstitutionalized beneficiaries and the administrative data used in this publication.